Voting Schedule - On November 8 vote for me, Charles W. Oddo, for Fayette County Commissioner, District 5, AT-LARGE All voters are eligible to vote in the At-Large district. I will greatly appreciate yours! 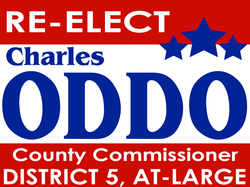 On November 8 vote for me, Charles W. Oddo, for Fayette County Commissioner, District 5, AT-LARGE All voters are eligible to vote in the At-Large district. I will greatly appreciate yours!